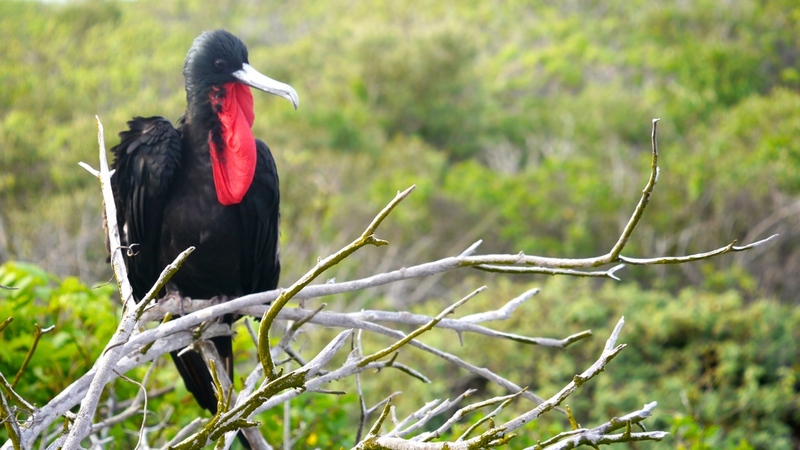 We flew from Quito to Guayaquil and then on to San Cristóbal Island in the Galápagos archipelago. We were met at the airport by José, one of two naturalists joining us on our voyage with Ecoventura. This particular week was designated as a family cruise over the Christmas holiday. The passengers were divided by the age of their children and assigned to one of three identical ships - Eric, Letty or Flamingo I. The teenagers on our ship ranged in age from 13 to 18 years old. The ship measured about 90 feet long with three levels. (Note: Ecoventura is updating its fleet to larger 150-foot ships but still only 20 passengers.) My husband and I shared a state room on the bottom deck, supposedly better for those passengers prone to seasickness. The room had small windows that you couldn’t really see out of and its own bathroom. Our room was a bit larger, as it was meant for three people instead of two. Our two boys shared another triple across the hall. The second level had a lounge, dining room, and kitchen, plus more staterooms; the third level had still more rooms. The top level was a partially-covered sundeck for lounging. We were in the water just a few hours after landing. All 20 passengers boarded two Zodiac boats, called pangas, for a short ride to our first of what would be many snorkeling sites. The ship provides snorkels, masks, and wet suits, but you can use your own snorkeling gear, if you wish. (Leave your personal wetsuit at home; it adds too much weight to your suitcase.) The highlight of this snorkeling excursion was a playful Galápagos sea lion, who was eager to swim around our snorkeling group. You could actually hear him making a “gluck, gluck” sound underwater. After dinner, we set sail for an eight-hour navigation to our next island. The water was rough, and the swaying made me ill. For me, it was a very long, unpleasant night. This morning, we had a wet landing (meaning that you disembark the panga in knee-deep water) at Darwin Bay on the island of Genovesa. 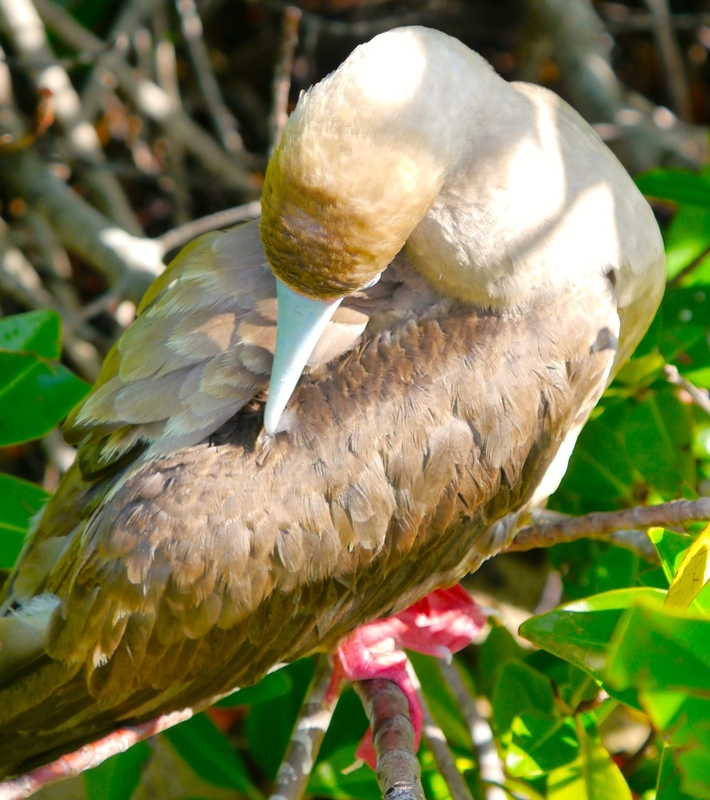 The island is a haven for birds: Red-footed boobies, Nazca boobies, Swallow-tailed gulls, and Mockingbirds, just to name a few. Frigatebirds nest here, as well. During mating season, the males inflate their red-throated poaches to attract females flying overhead. We were a little early for mating season, but we could see them starting to get primed for action. 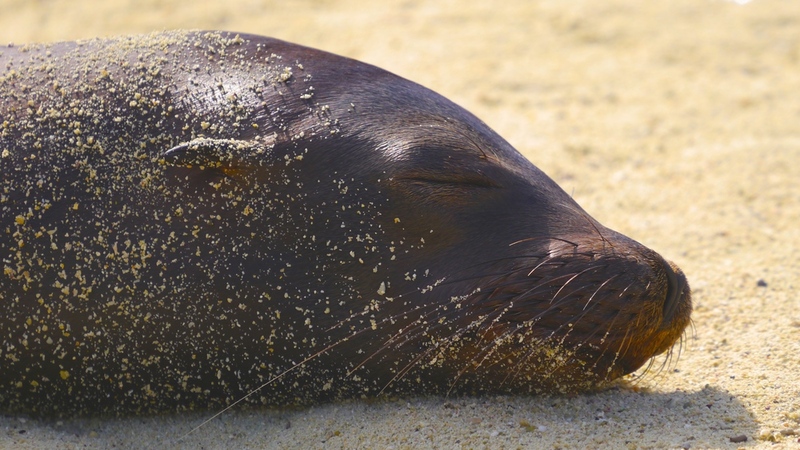 The coral sand beach is also home to a sea lion colony. Most of the sea lions were lying on the beach, uninterested in their human visitors, but a few swam in the water as our group snorkeled. In the afternoon, we made a dry landing at Prince Philip’s Steps. Again, it was like a bird sanctuary with Red-footed boobies nesting in the trees, and Nazca boobies nesting on the ground. In the open lava field, we got a glimpse of the elusive Short-eared owl in the distance. Our family, plus most of the others, had a very difficult night at sea, as the Eric navigated through even rougher water. At this point, I swore never to take a cruise again! The day started with a panga tour of Black Turtle Cove on the island of Santa Cruz. The mangrove was a perfect spot for seeing Blue-footed Boobies (my favorite bird in the Galápagos), pelicans, and Great Blue herons. 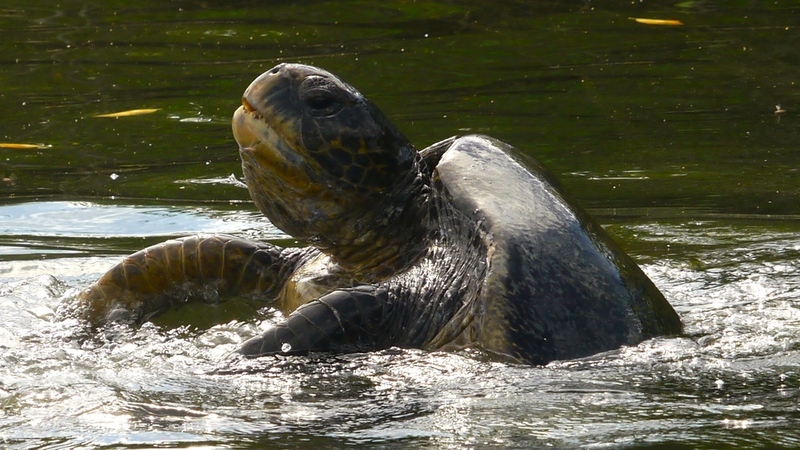 But the main attraction was the Pacific Green turtles, who were mating. The kids were excited to see nearly a dozen. After an afternoon kayak ride along the cliffs of Santa Cruz, we spotted more turtles in the water while snorkeling. They swim effortlessly in the ocean. Our afternoon walk lead us to a brackish (part salt water, part fresh water) pond where Galápagos flamingos were waiting. With a good night’s sleep, we were ready to tackle the next island, Fernandina. 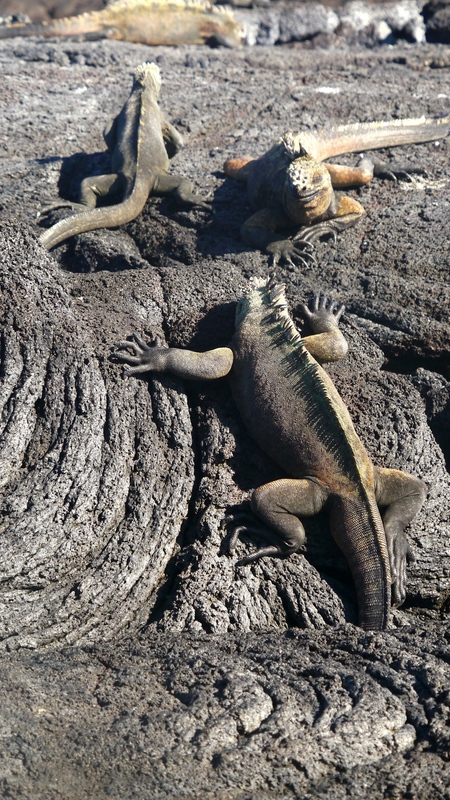 This island is home to more than 70,000 marine iguanas. They are everywhere! While they look menacing, they aren't aggressive. 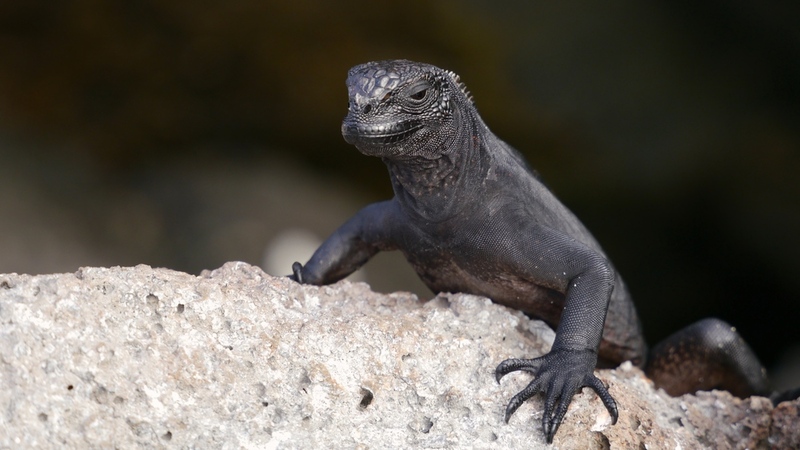 The Galápagos marine iguanas are the only ones in the world that swim. Click here to see. They’re an excellent example of adaptation. With nothing to eat on their lava rock island, they turned to the sea for food, namely green algae. The island is also home to thousands of Sally Lightfoot Crabs. I couldn’t stop photographing their spectacular red shells. Later in the morning, my youngest son found himself swimming with a very accommodating Pacific Green turtle. He was magnificent. Even teenagers have to admit that swimming with turtles is pretty cool. Click here to see the turtles in action. We also saw Marine Iguanas, swimming in the water. 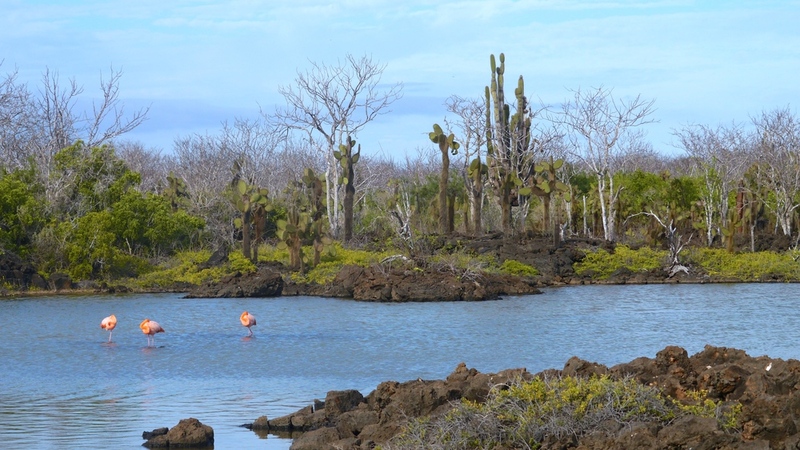 After a short navigation, we found ourselves on the largest of the Galápagos Islands, Isabela. The island itself is shaped like a seahorse. At Urvina Bay, we took a short walk to see land iguanas, and we were very lucky to encounter one of the famed giant tortoises in the wild. Back on the beach, we got our first look at Galápagos penguins. The penguins took to the water, as did we. Despite the murkiness, we could see them below, as well as harmless Blacktip sharks. The day started with a panga ride through the mangroves at Elizabeth Bay. 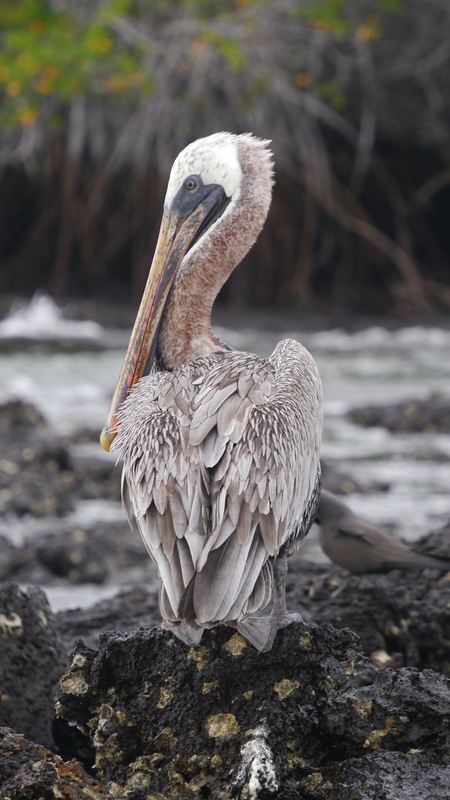 The mangroves are safe shelter for sea lions, turtles, Blue-footed boobies, and flightless cormorants. The highlight was spotting Golden Cownose rays. We followed along side of them, as they glided in unison. After a three-hour navigation, we found ourselves further north at Targus Bay, a favorite cove for pirates and whalers over the centuries. We all enjoyed kayaking and the best snorkeling of the entire trip. Our group hugged the rocky shoreline and peered down into the crystal clear water. 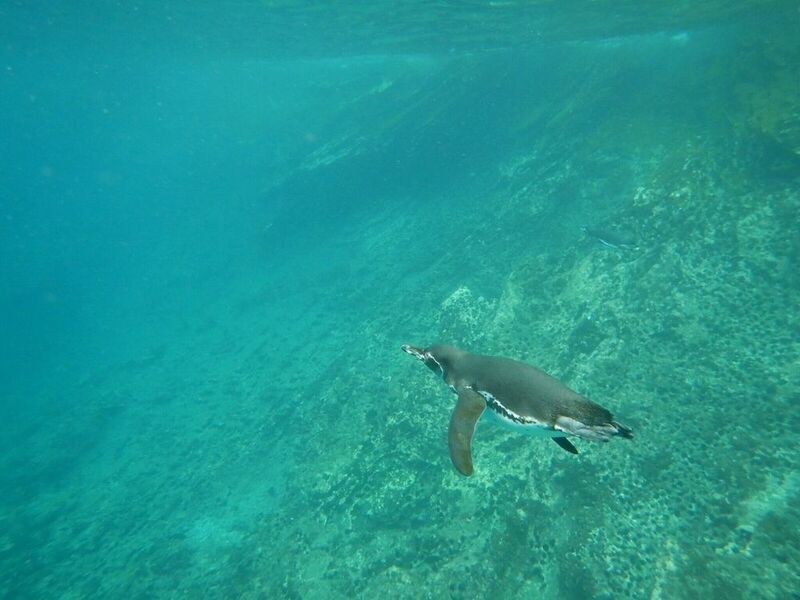 We could clearly see penguins swimming, many more than the previous day, and two more sharks, again harmless. Our naturalist, Freddy, captured some great video of the penguins. Watch it here. Then came the best moment of the entire trip for my sons. 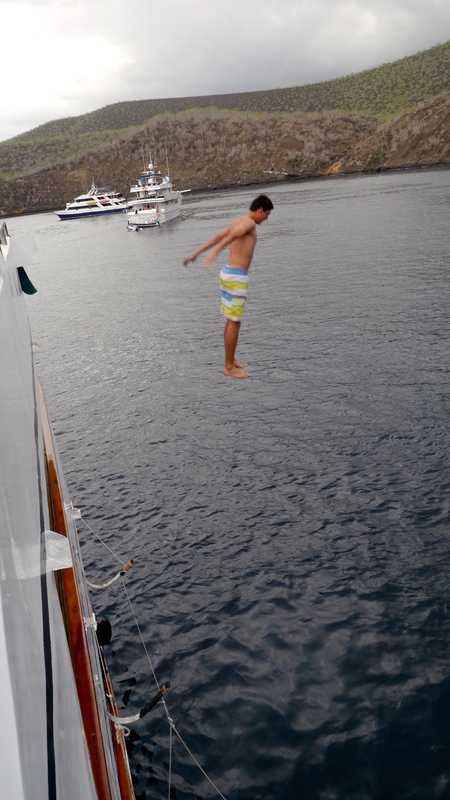 The captain allowed passengers to jump off the top deck of the boat into the deep blue water below. My oldest son, jumped before I even made it up the stairs. And you didn’t have to tell my youngest son twice! He jumped four times. Even Dad took the plunge. I served as the official photographer. It was Christmas Eve, and before our special holiday dinner, the Galápagos Islands gave us two gifts. First, we drove through an enormous pod of dolphins. There must have been more than 50, all leaping into the air. The sight was breathtaking. And then, we had a whale sighting. It was a young 18-foot Bryde’s whale, surfacing and spouting to our delight. The evening ended with the crew passing out Santa hats and gifts to all the passengers. The day began with a short walk on the island of Santiago, also known as Darwin’s favorite island. Charles Darwin spent 11 days on this island collecting specimens, mostly because he did a poor job of collecting and organizing samples on the other islands that he visited. This island is not particularly interesting. It was once inhabited, which may explain why wildlife here was less abundant. The water was murky for snorkeling, though both my sons spotted another large Blacktip shark, lying on the ocean floor. In the afternoon, we stopped at the small island of Rabida and its red sand beach. For the first time on our voyage, there was no panga ride or nature walk, just beach and snorkeling time. My youngest son enjoyed the lack of structure. The snorkeling was outstanding with crystal clear waters and an abundance of colorful, tropical fish. A word about the food on board: we found it to be very good and abundant. The breakfast buffet usually consisted of three or four hot choices, plus breads, fresh fruits, yogurt, and cereal. Lunch, again, was a buffet with several hot choices, plus salad and dessert. The cakes were freshly-baked and tasty! Snacks and juices were served after the morning and afternoon excursions. Dinner was a four-course sit-down affair. You chose from two entrées (usually seafood and chicken/beef/pork; vegetarian options are available). House wine, beer, and sodas were complimentary. Hats off to the chef, sous chef, and our waiter, Hugo! We spent most of today on land. After finally getting our sea legs, many of us actually felt a little unsteady on land. We headed by bus to El Chato Ranch in the highlands of Santa Cruz. The ranch borders a protected preserve for giant tortoises. The tortoises move freely between the two areas. At the ranch, we pulled on high rubber boots and sloshed through the mud, looking for the Galápagos’ most famous residents. They weren’t hard to find; there’s approximately 5000 to 6000 tortoises in the area. Weighing up to 650 pounds, these giants aren’t going to be winning at races, but they are likely to outlive us. Tortoises can survive for an entire year without food and live up to 200 years! So that we could appreciate what it’s like to be a tortoise, we were able to crawl inside a giant shell. We lunched at a seaside restaurant in Puerto Ayora, the island’s largest town. 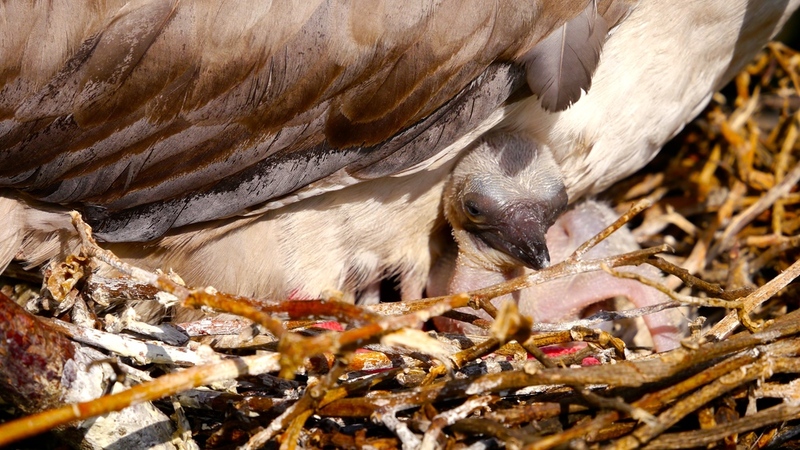 It’s also home to the Charles Darwin Research Station, where eggs from the wild are brought to hatch. As part of a conservation effort, those baby tortoises are raised at the center for five years and then released back into the wild. While the center does good work, the visit was a letdown. After seeing tortoises in the wild, one can skip seeing them in captivity. The day trip ended with souvenir shopping in downtown Puerto Ayora. All the passengers agreed that we only needed half the time. We were happy to board the boat for our farewell cocktails and dinner. The sushi was a huge hit with the kids! We were off the ship fairly early, as the crew needed to ready it for another cruise leaving that afternoon. We spent less than an hour at the interpretative center on the island. 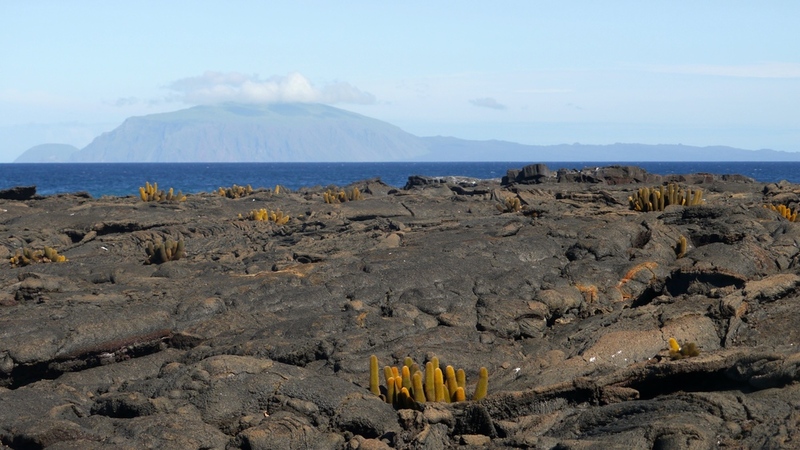 Some passengers wished that we had stopped here on Day One as an introduction to Galápagos’ history. Then there was more time (too much time) for shopping and snacks in town before heading to the airport. Earlier, I swore off cruising in the future. But once I got my sea legs, I reconsidered. More importantly, once I saw how much both my sons enjoyed it, I promised to cruise again. 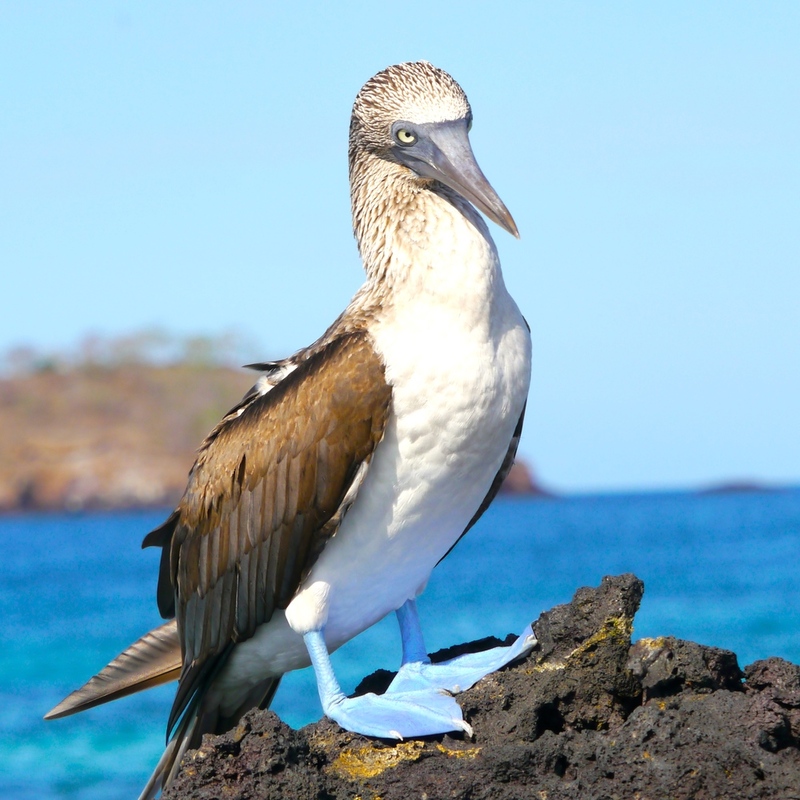 Hands down, it’s the best way to experience the Galápagos Islands. I have nothing but praise for Ecoventura and the crew of the Eric. The one thing that I would change? I would opt for a 5-night/6-day cruise instead of 7-night/8-day trip. A week is a long time on a boat. However, if you ask my sons, they both wished that the trip had been even longer! 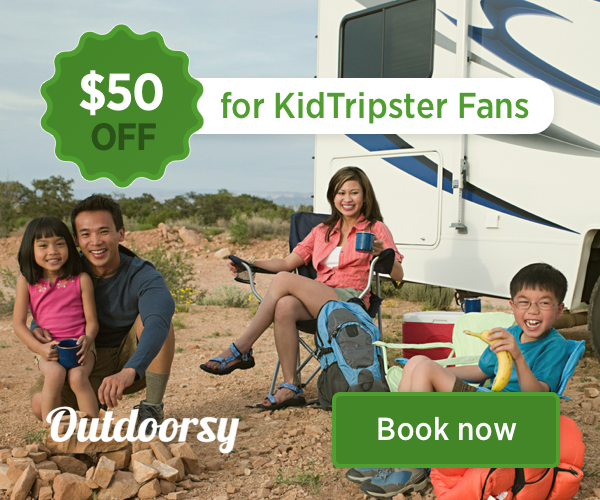 Is your child ready for a Galápagos cruise? Editor Shellie Bailey-Shah advises you to ask yourself these questions.